Garner, Ken (2007). The Peel Sessions: A Story of Teenage Dreams and One Man's Love of New Music. BBC Books. Heatley, Michael (2004). 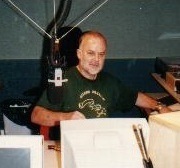 John Peel: A Life in Music. Michael O'Mara Books. Peel, John; Ravenscroft, Sheila (2005). Margrave of the Marshes. Bantam Press. Peel, John (2008). The Olivetti Chronicles: Three Decades of Life and Music. Bantam Press. Wall, Mick (2004). John Peel: A Tribute to the Much-Loved DJ and Broadcaster. Orion Books.